This Community Post was written by Embracing Arlington Arts and underwritten by Washington Workplace, a Columbia Pike-based designer of innovative, high-functioning work environments which is proud to support the arts in Arlington. 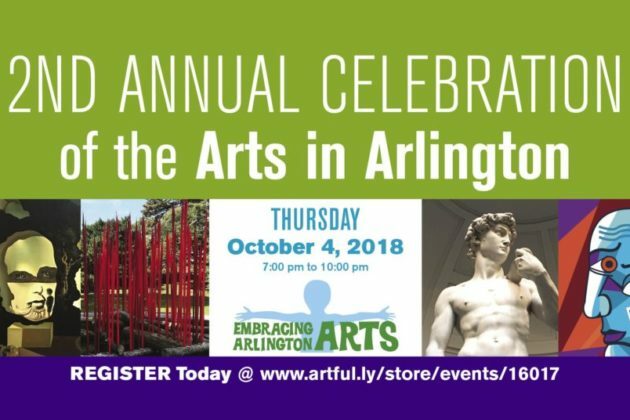 Embracing Arlington Arts is hosting the 2nd Annual Celebration of the Arts in Arlington! Enjoy music from The Walkaways. Eat delicious food/desserts from 18 restaurants. Toast the arts with wine, beer and bubbly. Dress as artwork to win a $250 car detail voucher donated by Mercedes Benz; two runner-ups will win $75 Copperwood Tavern coupons. 100% of the proceeds will benefit our campaign to build a performing arts/live music venue in Arlington! Buy tickets at: https://www.artful.ly/store/events/16017. Thanks to these companies/individuals for sponsorships! No celebration is complete without drinks so THANKS to our beverage sponsors. New District Brewing Company will serve original brews. Our wine partner is A Life Well Drunk.